D-Star: Normally I hang out on Reflector 62C. Echolink: Via W3ICF (node 14613) or via my Open Repeater Project test repeater node. AllStar: Via my Open Repeater Project test repeater node. I have recently gotten back into Ham Radio (Amateur Radio). I started messing with ham radio back in the 80's but when I moved to Texas shortly after high school I never did anything more with it. That was back when you needed to know morse code to even get a novice license. I never renewed and the license ended. I recently took all 3 tests to get the extra class license and am really enjoying getting back in to ham radio. Things have really changed since the 80's. You can now get a 2 meter / 70 cm 5 watt radio from china for $35. That was unheard of back in the day. I have a HF Rig built and really enjoy the digital modes on HF. I have been hanging around 20 meters and doing PSK31 mostly but experimenting with other modes as well. I have an 80 meter dipole that works better on 20 meters because of it being so close to the ground. I am working on getting it raised higher to get better performance on the longer frequencies. I have also gotten into D-Star and love the fact that you can talk with people all over the world with the audio quality of digital just by using a 5 watt handheld and a small hotspot running on a Raspberry Pi. I also live in an area that has a few D-Star repeaters. What amazes me is the community around amateur radio is still as helpful as it was back in the 80's. Everyone is so great and very patient. You do not find communities like the amateur radio community very often anymore. If you would like to try to connect for QSO or just say hi you can normally find me on D-Star on reflector 62C. I monitor that when at home with the Hotspot and my local D-Star repeater also is normally connected to Reflector 62C and I listen to it when mobile. On regular FM, I monitor W3ICF (echolink node 14613) in Frederick and WA4TSC in Bluemont Virginia. My HF usage really varies based on available time, but when I am working in my office or mobile you can get me on Reflector 62C or W3ICF (via echolink if you are not local). My "Shack" is not really a shack in the traditional sense. It is a dedicated area in my office though set aside just for amateur radio. Let's start out with some pictures first then I will describe what is going on. Ok, lets start with the first image. This is a view from the side of what I call my "stack". So it is a Shack Stack. Sorry, could not resist. In this picture you see 3 Raspberry Pi's and a ODROID mounted in together. The top Raspberry Pi is the Shack D-star Hotspot that is also now being used for the high-power hotspot. The next one down has the DV4Mini on it. The 3rd one down is the local Echolink / Allstar gateway and the bottom one is a new board that I am testing with the Open Repeater Project called an ODROID. All of them are running the Open Repeater Project image. You will also notice some low cost Baofeng radios. One is modified to work with a radio interface and outputs COS when a carrier is received. Since we modified it, we have found a better non intrusive way to detect carrier on the low cost handhelds. The other is setup and receiving W3ICF (146.73) and sending the audio to Broadcastify. You will also notice a USB hub that is connected to my main computer I use for ham radio. The RTL-SDR is connected to the QFH antenna on the tower and is used to receive weather satellite images from NOAA Satellites 15, 18 and 19. This is a front image of the stack. From the top down, you see the Motorola GM300 radio that is used for the echolink / Allstar node, then next shelf hold 2 computers. The one on the left is an I5 Intel NUC and is now my main ham radio computer. The one on the right is an I3 and is dedicated to listening to the weather satellites and reading the weather data from the Oregon Scientific weather receiver that is mounted below. The next shelf currently has 2 Raspberry Pi's on it. The one on the left is the Pi that is streaming W3ICF to broadcastify. The audio comes from the Baofeng and goes into the Pi where it streams the audio. The Pi on the right is dedicated to ham radio is the my unix box for the things I need to do on unix. It is a model 2b and is more than sufficient to work as a desktop PC. The next shelf is just holding an old SWR meter and a Byonic MTT4B that I experiment with. The next shelf is holding a kantronic controller that is not hooked up at the moment and my Hack RF. Below that the Oregon Scientific wireless receiver that is receiving the wind, temp etc from the tower mounted sensors and a few others as well. Next is the radio panel. On the left are 2 ID-880h radios. The top one is connected to the 6m/2m/70cm antenna on the tower is typically tuned to KB3YBH B in frederick. The bottom on is typically tuned to the hotspot. In the picture it must have been tuned to Reflector 62C which is where KB3YBH normally is connected to also. On the right on the top is the yeasu that is used for experimenting with data and digital modes mostly. Currently it is my high power D-star hotspot. Below that is the TYT 9800D which is my main FM radio I use. The small radio under the shelf is a small 10W VV-898. This was my first radio when I got my license again. I mainly use it for experimenting and listening to APRS data, etc. Next to it is a ANKER 40 Watt USB charger. I use it to charge multiple things. The headset that is sitting there is being charged. So many things now charge off of USB, it is nice to have a high power charger handy. In the background you see a couple of Raspberry Pi's. Those are testing the radio interface board that I designed to work with the Open Repeater Project. You will also see another ODROID, this is a more powerful 8 core version that we hope can run 4 or more repeaters at one time. This is my working area. I have 4 different computers that I can control from this location. Both of the Intel NUC machines in Image 2 (one for ham radio, one for weather), the raspberry pi and the old ham radio machine. My HF rig is a Yeasu FTDX3000. It is connected via USB to the main ham radio computer and I can control it using either N1MM Logger or Ham Radio Deluxe for the digital modes. The Signalink USB I used to use with my old Kenwood radio but is not needed with the FTDX3000. I still use it as an audio interface though. The small sound board on the right has 2 aux sends, one of them I send into the Signalink and capture the audio. Each radio and the computer connect to the sound board and I can adjust volumes and send audio to different locations for experimenting. 6 different Boafeng radios, an 8 watt version is my primary carry radio. Some of the others have been modified or are used for experiments. Sometimes I use them for GMRS too with the GMRS household license (WQVVK227). The laptops are used for portable operation with dongles or echolink. The old laptop is running a blue DV Dongle and is translating the audio from KB3YBH B module and streaming it to broadcastify. Under the desk you see the radios that have remote heads mounted. I put them on the floor so the fan noise is not so bad and also, cool air falls to the floor. You will also see lots of cables and power cords for the charger for the handhelds. Not sure how to make all of that look neat and tidy. One thing that was missing from these pictures is the Yeasu FT-2600M radio that I have dedicated to APRS. Currently it is only receiving and acting as a iGate but I am planning on turning on the digipeater function in low power mode soon. 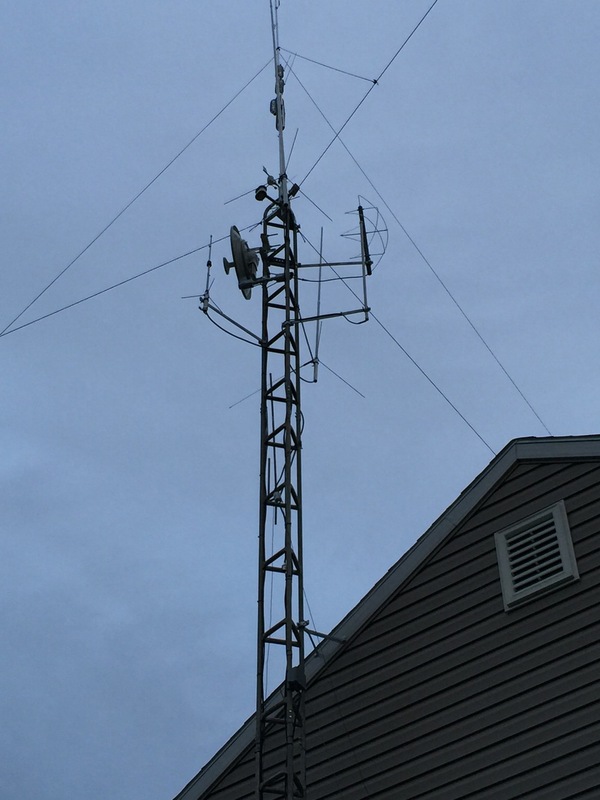 This past fall (fall of 2015) I put up a 40 ft tower. There were a couple of reasons I decided to put up a tower. First was I wanted to get the antennas higher. I live on the top side of a hilll. Notice I said top side not top. I have some hill that is still above me. I also live really close the mountains so any height is better. I also am trying to connect to a local wireless IP emergency network called the Mid-Atlantic IP Network or MAIPN and needed the height to see the different access points of the network. I also wanted to get my wire antennas and dipoles higher off of the ground, move the weather station to higher ground above the house and more. That is a short overview of the tower. I have to thank my Brother In-Law (Damian Gsell), my Step Father (Bill Gift) for doing all of the hard work. I was mostly ground crew support for the project. My Father In-Law also helped with a lot of the grunt work like digging holes. I would like to add another 20 feet to it but I bought the tower on Craig's List from the wife of a Silent Key. The tower had never been used and just was sitting in the back yard. However, there is no manufacturer name on it so I am not sure who I would buy the 2 10 ft sections from. At current I have 2 d-star hotspots. One in a rugged case with a batter and charge controller that I can throw in my car and plug in to a lighter to charge or plug into a power adapter to charge. It runs about 36 hours on a charge before needing to be re-charged. It is a deep cycle battery. I typically leave it plugged into an AC charger all the time and put it in the car when going on trips or if I need a portable d-star hotspot somewhere. The other hotspot is sitting in the shack area of my office. It does not move anywhere. Both hotspots are running the Open Repeater Project images. I recently picked up a DV4mini dongle that can do D-star, DMR, Fusion and P25. Since I already have 2 D-star hotspots I am using it for DMR and Fusion. I do not have a DMR repeater anywhere close to me yet so this is my only way to get on DMR. I am testing the Open Repeater Project's latest image that has support for the DV4mini dongle. Like DMR, I do not have a Fusion repeater close enough to me yet so I use the same DV4Mini that I use for DMR for fusion. Using the Open Repeater Project image I have a local Echolink and Allstar node running locally that allows me to connect to echolink nodes and allstar nodes. Right now it is running through a low cost $35 Baofeng for testing. I have also had it connected to a Motorola GM300 radio. I keep changing and testing different interfaces and radios so that I can test the images. I really like working the digital modes on HF. I have been working PSK31 trying to get more contacts and hope to start trying other modes over the winter. I am building a high power d-star hotspot. Mainly for testing how the Open Repeater Project image works with running 2 d-star repeaters on a single Raspberry Pi. The high power hotspot will run from the same raspberry pi that is running my low power hotspot in the shack. The low power hotspot is running a dv3000 VHF/UHF board. The high power hotspot will be using a DVRPTR_V1 board attached to a Yeasu radio. Those of you that know me know I tend to do more than just dabble. I have started a project called the Open Repeater project where the goal is to build a fully functional repeater that is fully open sourced with as many features as possible in a very easy to use and setup web interface. The idea is to think of the Open Repeater Project like a Swiss Army Knife. In a Swiss Army Knife there is a number of different blades that each serves it's own purpose. One opens cans, one is a pair of scissors, one is a file, one is a saw and one is a knife. The Open Repeater Project is like that, you download one Raspberry Pi image and by using an easy to use web interface you select the features you want to activate and use the same web interface to configure the options. It can do the functions of a full blown repeater, d-star hotspot or repeater, APRS, Packet Radio, HamNet, and so much more. No need to download all of the different images or software and figure out how to use it. One simple image and a simple web interface and you are good to go. If you have never thought about amateur radio, you should consider it, why? Times are getting strange, we live under a threat of cyber attack and now we are being warned about attacks on the infrastructure. If we lost power for a week in the US what impact would that have? There is one thing that cannot be taken away and that is radio communication. Using a small battery or car powerI know I can communicate as far away as Tel Aviv on HF (my furthest contact on 20 meters with PSK31). All this without grid power. Amateur Radio needs some younger blood too. From what I have experienced, the Amateur Radio community is made up of more than 50% of retirees. Those people are not getting any younger and as that generation goes silent key, we are not adding new operators at the same pace. We are so used to having constant connectivity, what would happen if that went away. The first test to get an Amateur Radio license is not that difficult any more. You do not need to learn Morse Code to pass the test anymore. I think everyone should invest a couple of hours of study and take the test. You never know when you might need it. I could not find a QSL card that I liked so I designed my own. Not sure what best practice is, this is truly my own design. I make one side so it could be sent via postal mail if needed.